I’ve never had “pearly white” teeth, mine have always been on the off white/yellower side and I’ve always been a coffee / tea / wine drinker, so I’ve been whitening my teeth for years and have used strips and the awkward whitening gels with trays, which hasn’t worked for me and my sensitive teeth. Just when I was about to give up, Carbon Coco got in touch with me and asked if I would do a review, I was familiar with their products because I follow them on Instagram and was intrigued by their Charcoal teeth whitening system. 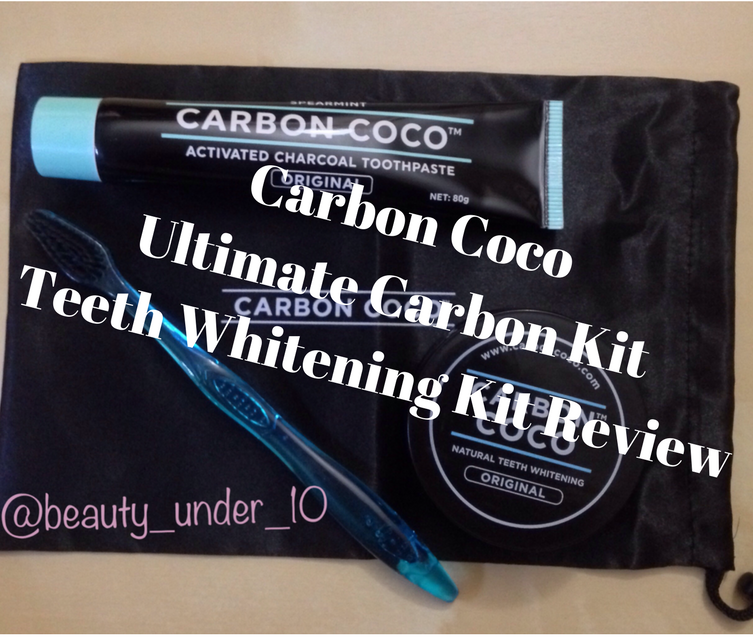 Carbon Coco is an Australian company that provides all-natural alternatives to oral care and teeth whitening. 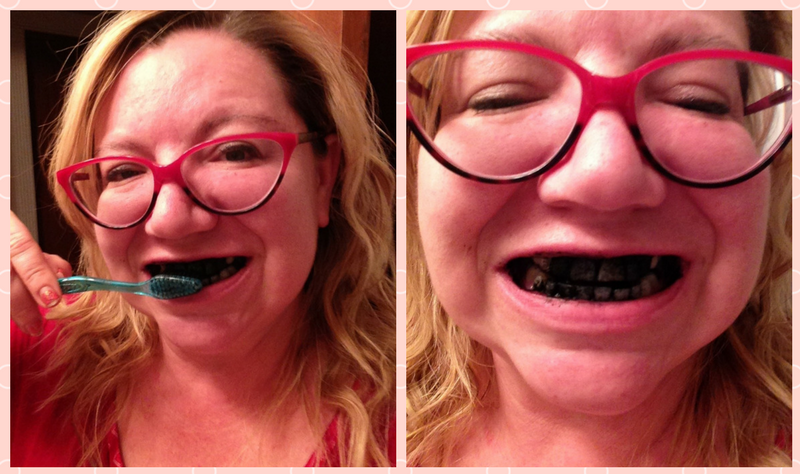 Carbon Coco uses Activated Charcoal made from certified organic coconut shell charcoal that will naturally whiten and polish teeth as well as strengthens enamel without any chemicals. Their products contain organic natural ingredients that are dentist approved and are cruelty-free. Activated charcoal is not the same charcoal used to barbecue hamburgers because it is heated in a special way that helps with the absorption of liquids and toxins, it has natural adhesive characteristics making it easy for the charcoal to bind with teeth-staining culprits like plaque, wine, and coffee. Carbon Coco’s tooth polish is in a powder form. It is tasteless, odorless and is made with Organic Coconut Shell Activated Charcoal, bentonite powder and a hint of lemon myrtle. Bentonite Clay Powder is useful in eliminating toxins from heavy metals in your mouth, like mercury from mercury fillings. Bentonite clay is also rich in minerals that can nourish teeth and gums. Lemon Myrtle is known for its lemony taste and antiseptic properties making it great for brushing your teeth and keeping your mouth in great shape. This can be used with the provided Carbon Coco toothpaste or with your regular toothpaste. This toothpaste is fluoride free and helps to fight cavities, plaque, gingivitis and bad breath. The spearmint flavor keeps your mouth feeling refreshed and it can be used in place of your everyday toothpaste. Because it has activated charcoal, it is designed to detoxify the mouth and protect your teeth from further staining. Using the tooth polish at night will allow the particles or residue to dislodge overnight. This kit is a 14 day system that can be used together for 14 days or until results are reached then you use the activated charcoal toothpaste as everyday toothpaste and use the Activated Charcoal Tooth Polish when needed. After a few days I definitely noticed my teeth weren’t as yellow. Because I was using the tooth polish at night, I would wake up with a very grainy feeling in my mouth but after about day 3 it felt less grainy. It didn’t bother my sensitive teeth or gums - it actually seemed to help my gums! My gums have always been red and puffy – I know I need to floss more often, but since using this system they aren’t as puffy and are more of a pink color. The only complaint is that the Activated Charcoal tooth polish powder gets everywhere, specks are in the sink, mirror, on my chest, hand and arm – it’s a bit messy. I’ve heard this happens with all powdered activated charcoal not specifically this brand. My teeth didn’t magically become super white but they aren’t yellow anymore and I do notice less staining now when I drink coffee tea or a glass of red wine. I like that it is simple, natural ingredients and that it’s Cruelty-free. Overall I have had a great experience using this system and will continue to use it!